The third module started with a warm-up session, which included updates from the participants on the events conducted in their respective school – some of the events were mid-term exams and sports day. Then the teachers were asked to share their awareness or their experience that was a direct result of the last module training. The following were some of the feedback. A teacher talked about his experience on providing 5 minutes bathroom break to his students before he started the class. He talked about how his students were far more attentive and focused after he had started this practice. A teacher had convinced his fellow teachers to do lenient correction for a few children who were only lagging behind in a particular subject. Due to the leniency, these children were placed among the rank holders of the class and the children were happy and wanted to perform better. Many teachers talked about their attempts at teaching through movement and play. The session provided an understanding about the difference between skill, knowledge and content. The reason a teacher needed to understand the difference between skill, knowledge and content to teach effectively was explained in detail. It was also emphasized through various examples; if skills are developed a child need use rote memory and comprehend what he/she is learning. In the next part of the session, language was discussed in detail and the following were discussed. 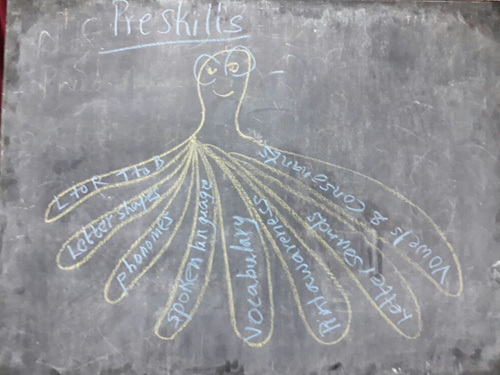 The final part of the session was on main skills in language like reading, writing, thinking and mathematics that were explained along with the need to understand the progressive nature of these skills. The academic success of a child depends upon proficiency in these skills. 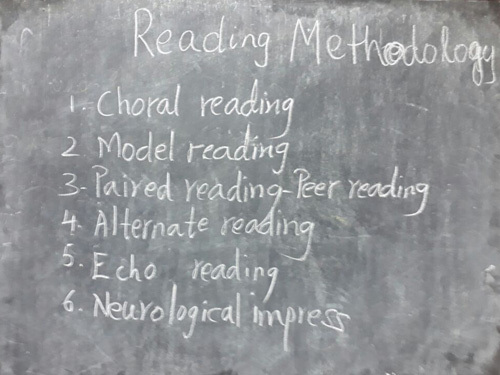 The session provided the participants information on the theoretical understanding of reading. The following topics were discussed in detail along with practical examples, games and demonstration. Pre-reading skills – Phonemic Awareness Various games were played to help the teacher understand strengthening of this skill among children. The games were played using both English and Tamil language. Phonics The alphabetical principals of English language were discussed and also the non-phonetic nature of the language, and the issues faced by the children due to it were discussed. Decoding Word families and its importance were discussed and also how the decoding skill can be taught using the subject textbook was discussed. 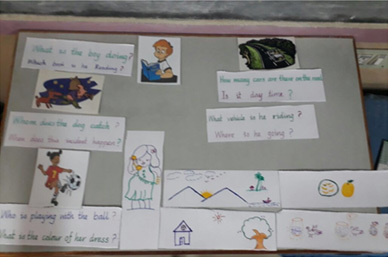 Sight words and its importance How to make children proficient in sight word reading were discussed along with sight word reading for subject-related words. Methods to build fluency Each of the methods was demonstrated to the participants so that they could practice the same in the classroom. Strategies for reading Various strategies for reading, which could be practised in the classroom using the textbook, were demonstrated. Intervention in Reading Various interventions that could be provided for a child with reading difficulty were discussed. In addition to the above-mentioned topics, the concept of word wall and how to play various activities using the same was discussed. Syllable and importance of syllabication in reading and word morphology was discussed in detail. To improve reading comprehension various techniques like sequencing, framing questions for a given picture or passage and others were demonstrated to the participants. The following brain gym exercises were taught to the teachers. Post-lunch training session began with movement by Ms. Arthi and Mr. Micky. The movement from the previous module was done and two new movement exercises were taught and the teacher also practiced the brain gym for reading. 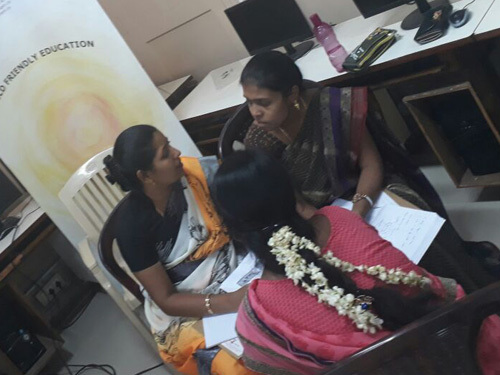 The session provided participants with real experience of using all the methodology taught in the morning reading module. The teachers were divided into groups of four. The following tasks were given to the teacher along with textbooks from classes 3 to 6. Stationary items like chart paper, sketch pens and pencils were provided to make classroom aids to help the children based on the task given. 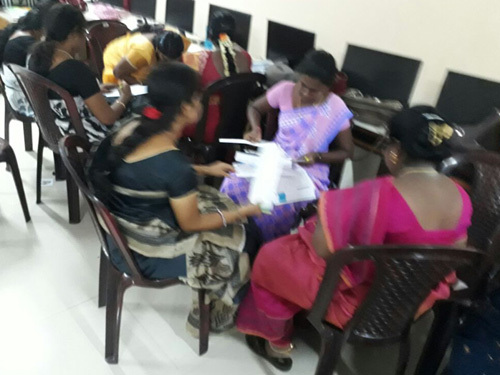 Alphabox printouts were provided to the participants for use in classroom. The teacher enjoyed this session and participated with focus and complete involvement. Afterwards, each group presented their work to the others. Some of the work by the teachers. The second day sessions started with singing. The participants were taught the following song and it was practiced part by part. Can you be like an eagle? Are you silent like a salmon? Can you light like a firefly? Brain Gym taught the previous day followed the singing. The session on spelling looked at the process of spelling. Reading is a decoding process and spelling is reverse, it is encoding process. Most of the children in a classroom have difficulties with spelling. Various difficulties in spelling especially the one from visual memory, motor memory and auditory discrimination were discussed. The criteria for a child with spelling difficulty and ways to address the difficulty in a sensitive manner were taught. Strategies for spelling and multisensory methods of teaching the spelling were taught with demonstration and the teachers were made to practice each of the technique so it can be transferred in to the classroom. 1. Snap and Clap – In a spelling clap for the consonant and snap for the vowel. 2. Stomp and Thrust – In a spelling stomp for consonant and thrust for vowel. 3. Write the spelling in the air or clay or water. 4. Write the spelling with the finger on the left arm. 5. Write the spelling on the black board. 8. Elkonic Box – It is to understand the sounds and its representation in a spelling. 9. Children with sequencing difficulty can be given exercises like the following. a. Unscramble the letters/ Match the unscrambled letters to right letters. The teachers were asked to write two sentences about any event that had happened to them since morning. After the teachers had finished the task, the processes involved in writing like thinking, language, syntax, semantics, motor aspect were elicited from them. The complexity of writing as a task was discussed. The following point in motor aspect of writing was taught. 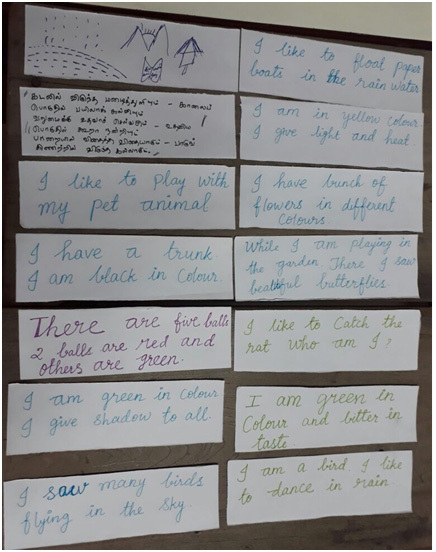 In creative writing and active learning session, various skills involved in writing like grammar, vocabulary, main ideas and supporting details were discussed in detail. The session comprised of many activities to teach creative writing in a fun and easy manner. The successful strategy of PHelps (picture help) was taught to the teacher along with a practical session on the same. Other techniques like substitution table, brainstorming and scaffolding were taught. Post-lunch training session began with movement by Ms. Arthi and Mr. Micky. The movement from the previous day was practised and new variation to the same movement was taught. The song from the morning was practised again along with different variations. In this session, Ms. Jayashree Ravinderan talked about different ways to replace the traditional chalk and talk teaching methodology. She discussed the following teaching methodologies that moved the student from being a passive learner to active learner. The session was followed by a practical session. 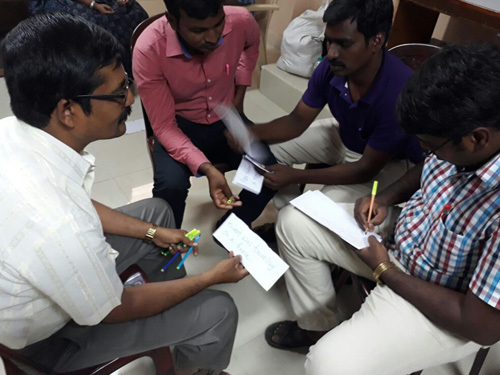 In the practical session teachers were provided with chapter from 8th-grade textbook Crop Production and Management. Teachers were divided into groups of 3 and they practised each of the technique with each other. The session recaptured what was learnt by the participants and was presented in a mind map format. 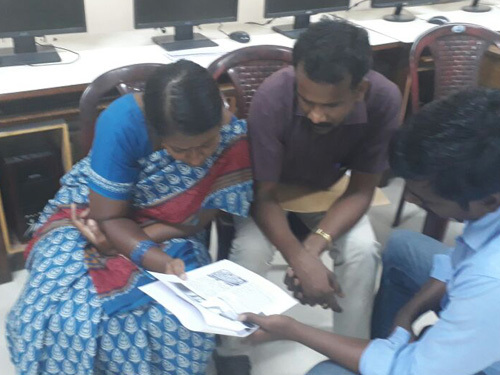 The trainer elicited all the information from the teacher, thus showing a way to do the same with the student in their respective classroom and the elicited answers were presented in a mind map format, and during the process the teachers were taught about mind map. Before the start of the second module, the teachers were asked to share their awareness, or their experience that was a direct result of the last module training. The following were some of the feedback. A few teachers said that they had started including more play-way method of teaching. Teachers taught the Tables with movement. Teachers shared the proper way of letter formation with parents and colleagues. 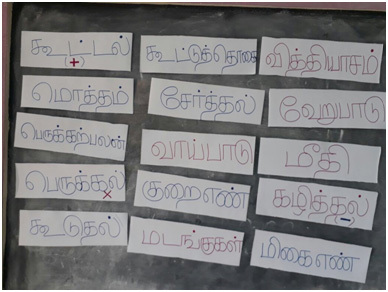 A Tamil teacher used songs to help his children memorize the Thirukural. Many teachers tried writing the letter on the floor and walking the letters. A teacher who was struggling with a child on letter recognition tried the multisensory method and after a few sessions, the child got all the letters. A teacher reported a meeting with a parent of a child with behavior problem. She talked about how her approach was from understanding the child. How many cells are there in the brain, and how the many connections are made? How are the connections made? She proceeded to explain how the neural connections are made in the brain and a teacher can plan a lesson to follow the organic learning by the brain. 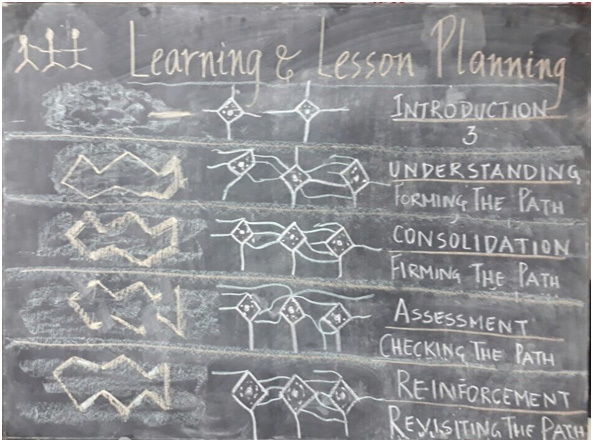 She took the teachers through the following steps of making a lesson plan that helps in creating the connections between neurons and strengthening these connections. 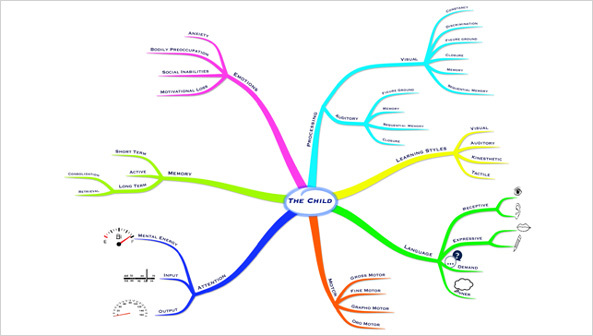 The session was presented in a mind map format for understanding the factors that aid or affect the learning of the child. Each of the above-mentioned topics was explained through various stimulations, which included games, video clipping and activities. Post lunch, the training began with movement by Dr. Suchitra Ramkumar. She recapped the movement exercises done during the last module along with a new movement using beanbags. 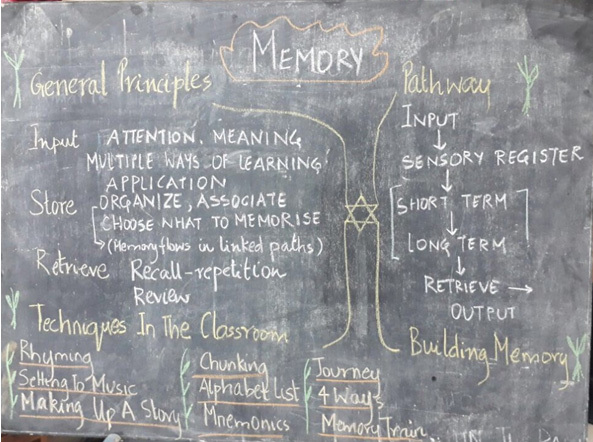 The session was a practical session where Dr. Suchitra explained the process of memory and activities that can be done in the classroom to strengthen the memory. The participants were split into various groups and each participant was given a memory technique and was asked to come up with a lesson to demonstrate the same. Chunking (the teachers had chunking story into three parts). The session was about nine intelligence as proposed by Dr. Howard Gardner in Mulitiple Intelligence. The previous day's session was recapped by Ms Arthi and then she went on to explain breakdowns in attention and memory. Various ways of remediation within the classroom in both the areas were also discussed. The session covered specific learning disability (Dyslexia). The other disabilities explained were dyspraxia, dysgraphia and dyscalculia. The session included activities to help teachers understand the children with learning disability better. Ms. Shruti explained the relationship between physical and learning. She proceeded to explain the heterogeneous nature of LD children and the behavior to look for in the classroom. She discussed various topics like Visual-Spatial Disorder, dysgraphia, Motor Dysgraphia, Spatial Dysgraphia and affects of Dysgraphia, Attention and handwriting problems. Post lunch, the training began with movement by Dr. Suchitra Ramkumar. The previous day’s movements were practiced to achieve mastery so that the teachers in the classroom could impart the same. 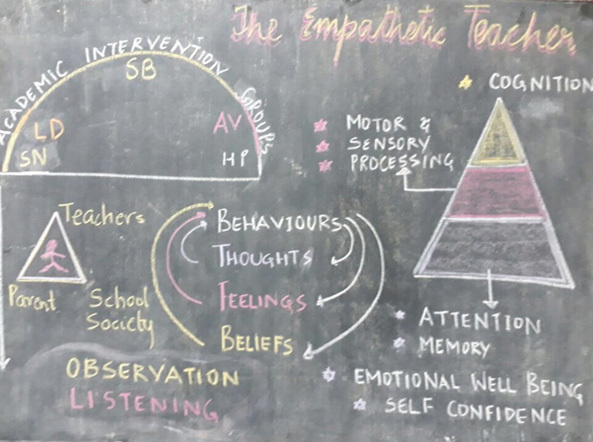 In this session, Dr. Suchitra took the teachers through an understanding of behaviors, thoughts, feelings and beliefs. Last session of the day was by Ms. Arthi on various accommodations that are available with different educational boards for children with Learning Disability. In addition, the detailed list of accommodations that can be provided for the children with learning disability within the school and classroom were discussed. The day ended with feedback from the participants. Most of the participants wanted us to do an awareness program for the school principals and management. The workshop commenced with an inauguration ceremony. Forty Six (46) teachers have registered for this 8 day training workshop. The following people attended the inauguration ceremony. Rev. Fr. 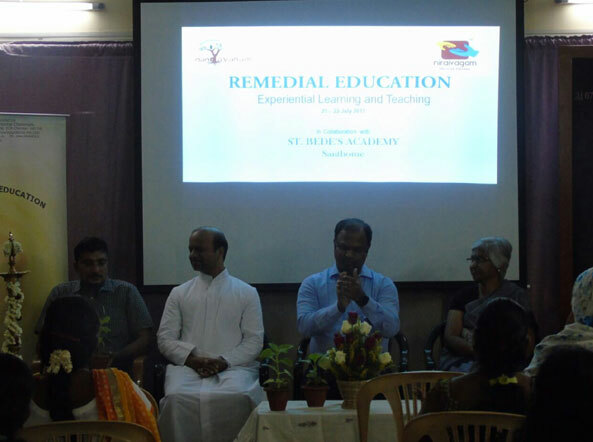 Michael Viyakulam – Rector and correspondent of Don Bosco schools Katpadi. Rev. Fr. Arockiadass – Headmaster of Don Bosco Matriculation, Hr. Sec School, Katpadi. Fr. Paul Raj – Director Niraivagam Psychological Services. The ceremony began with lighting of the lamp by the above-mentioned participants. 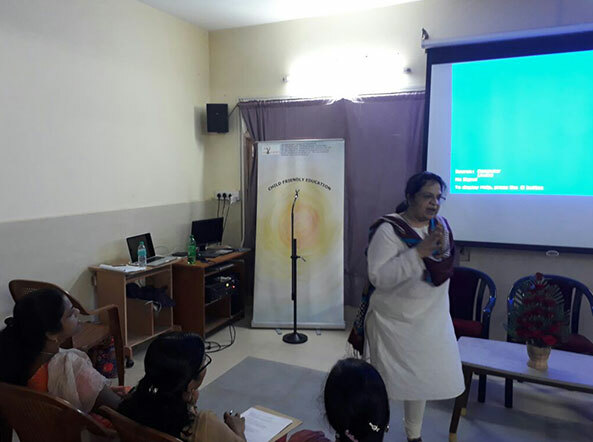 After the lighting of the lamp, Dr. Suchitra Ramkumar spoke about the conception, thought process and the objective of the workshop. After that, Rev. Fr. Michael Viyakulam spoke to the participants. He talked about the preventive educational ideas of Don Bosco and emphasized upon love and kindness in imparting education rather punishing the students. 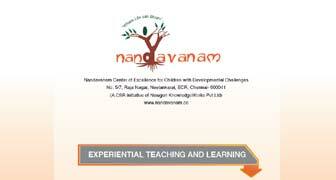 He also urged the participants to take full advantage of the knowledge provided by Nandavanam to the fullest. Next, Ms. Shobhna Jaya Madhavan gave a inspiring talk based on her experience with two teachers who contributed significantly to her growth in life. She wished the participants to become inspiring teachers. Finally, the inauguration was concluded with a Vote of Thanks given by Fr. Paul Raj. Management attitudes towards holistic education. Dr. Veera began her session with a thought provoking question on “what is the meaning of education?”. She further went on to talk about “what do we educate and what do we develop in chidren?” She explained the relationship between home, school and world model as proposed by Steiner. She proceed to explain the child, who is being educated as someone who not just carries a herititary traits but also has a spiritual dimention. She continued to discuss the importance of the period between 0-7 in child development. This age group is fundamental in organ development and discussed motor milestone and speech milestone. She explained the long standing impact on health, when a child is stressed in this age group. She further went on to discuss the significance of rhythms of day in child development. 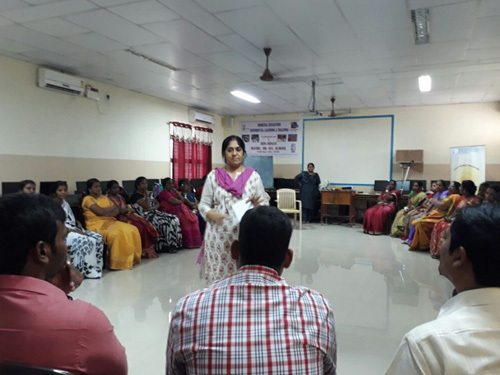 She made the participants do an activity involving pebbles to help them understand the relevance of awakening the feeling in children to help them understand and learn better. Love and care by the teacher will awaken the child and help the child in learning. Highlight the child’s strength rather than the weakness. Too much of logical thinking without creativity can lead to hyper anxiety. Post lunch, the training began with session on movement by Dr. Suchitra Ramkumar. The participant though little apprehensive in the beginning enjoyed it immensely as the session progressed. Inner Development of the child in relation to physical growth. Ms. Anandhi talked about the Inner attitude of the teacher and the need to educate the feeling life of a child to help him learn better. Then she taught “A holistic approach to language learning. She discussed about the process of language acquisition as being first speech, then writing and finally reading. 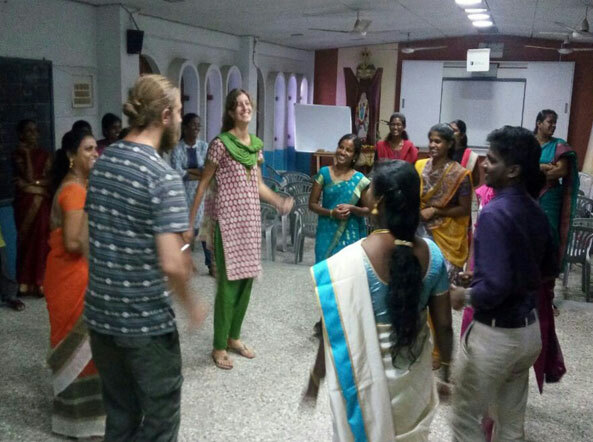 She worked with the participants using various activities, exercises and movement to teach children like tables, letter recognition, letter formation, sound of the language and to help children understand the sense of rhythm. She taught them to work with the Night as an important tool to let the child assimilate the learning’s of the day. Is there a need for such a vast content for a child? How to persuade the management to nurture the feeling life of a child? How to I reach the inner life of a child? How to touch the feeling life of a child? The day ended with 10 minutes session by Ms. Arthi summarizing the day’s session. This was used as a reflective time for both the participants and trainers alike. The day started with the recap of the previous day. The participants mostly talked and recalled the techniques that were taught and their plans to use the same. 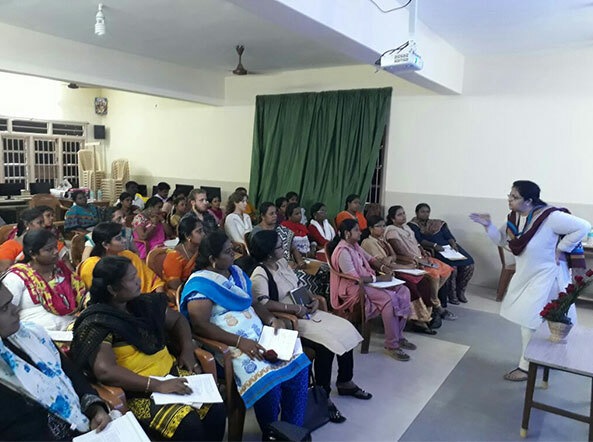 Dr. Veera Punch started the session explaining the above written verse and proceed to talked extensively about the developmental stages of a child in terms both physical and soul development. She concluded the session pointers for teachers, seven virtues of teacher and reflective questions. Ms. Anandhi conducted the Post lunch session. She taught the teacher various games involving movement for various subjects like math, language, science, and geography. The movement and games were designed to awaken the senses of children and help them in being alert and focused. The day ended with Session by Dr. Suchitra Ramkumar summarizing the day’s sessions, day’s reflection and a brief about the next module. What are the 3 things are you will carry forward in your teaching? What are the 3 things that did not work for you in the workshop? The second module started with the teacher’s feedback about their experience that was a direct result of the last module training. The first session of the day by Ms. Subbha Vaidyanathan on sensory processing, learning style and attention. What is needed for a child to grow? She talked about the role of nature as well as nurture in child development. She explained in detail the following areas of child development. 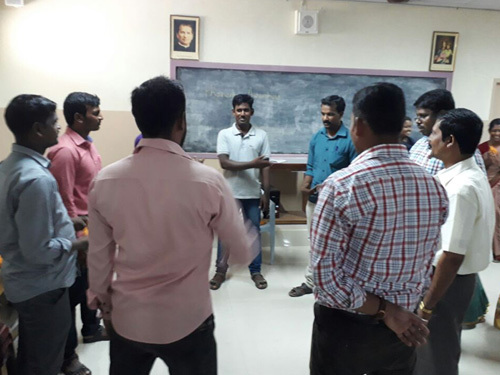 Sensory Development – Visual and auditory procession and perception were discussed. Subtopics like memory, sequential memory, and closure of visual and auditory memory were discussed in detail. Speech – The importance of onset of speech was discussed in detail. Language – The difference between speech and language was discussed along with the importance of pairing in a classroom and how learning happens mostly through pairing. Play – Importance of play and stages of play like solitary, parallel and interactive play. Behavior – Oppositional, separation, anxiety, timidity, bullying, school refusal behavior were discussed. Executive function – Role of executive function in learning and real life was discussed. Some of the principles of development that were stressed upon are that all areas of development and learning are important. Learning and development follow a sequence. Development and learning proceeds at varying rates. Children learn in a variety of ways. Play is an important vehicle for the development of self-regulation and promoting language, cognition and social competence. Post-tea break, Ms. Subbha discussed learning difficulties and learning disability. She started with the identification of LD child and what is learning disability. She talked about some of the misconceptions that surround children with learning disability. She emphasized on what cannot be termed Learning Disability. Early indicators and some of the sample works of children with LD were shown and discussed. Some of the common Learning Disability like dyslexia, ADHD, ADD, Dysgraphia, Dyscalculia were discussed in detail. The primary and secondary effect of LD were also discussed. 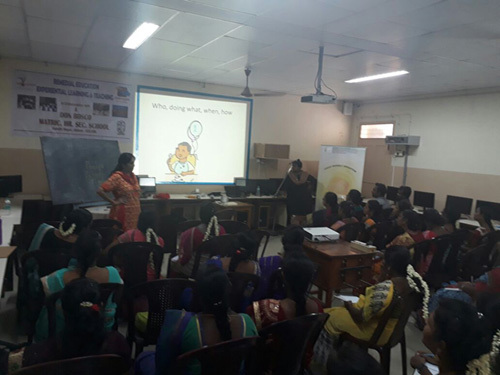 She talked about to whom the child should be referred as a part of referral system and discussed different scenarios and options available with the teachers to help the child with LD. Post-lunch session started with movement exercises, a participant taught the class a new variation of the exercise taught during the previous module. The exercises from the previous module were practiced again. Dr. Suchitra asked the participants to summarize the morning session to establish the role of categorization. Headings and subheadings were created from the summarization. Then the participants were asked to present their idea of the brain to help understand the circuit of understanding. The structure of the brain and the number of neurons, nerve connections, and cell connections were discussed. Brain cell connectivity was explained with examples. The following topics were explained along with examples. How smart am I? How am I smart? What do we mean by intelligence? Who in our opinion are intelligent? How is intelligence shown by a person? The traditional view of intelligence was discussed and the emergence of MI was explained. She explained the concept with the house and various doors to get inside the house. Development pathway is there for all intelligence and there is a start-and-end potential for all intelligence. The following intelligence was discussed in details. Each intelligence was discussed with video clipping and follow-up questions to strengthen the participants understanding of the same. Each intelligence abilities, core competencies and professional choices were also discussed. The participants were also provided with a questionnaire to determine their intelligence. The post-lunch session started with movement. A different variation of the previous day's movement was taught and practiced. Ms. Shruti explained the relationship between physical and learning. She proceeded to explain the heterogeneous nature of LD children and the behavior to look for in the classroom. She discussed various topics like Visual-Spatial Disorder, dysgraphia, Motor Dysgraphia, Spatial Dysgraphia and the affects of Dysgraphia, Attention and handwriting problems. Dr. Suchitra started the session with the following representation. She explained the structure of the brain as reptilian brain, mammalian brain and cortex. She talked about the reasons that children with LD suffer the most in the school. She discussed the difference between the other difficulties and specific learning difficulties. The workshop commenced with an inauguration ceremony. 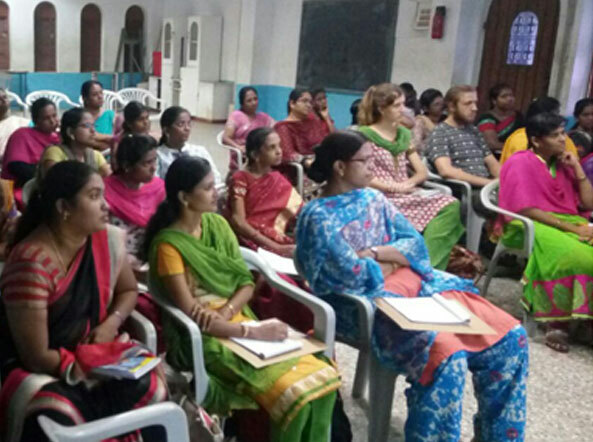 Forty-one (41) teachers had registered for this 8-day training. 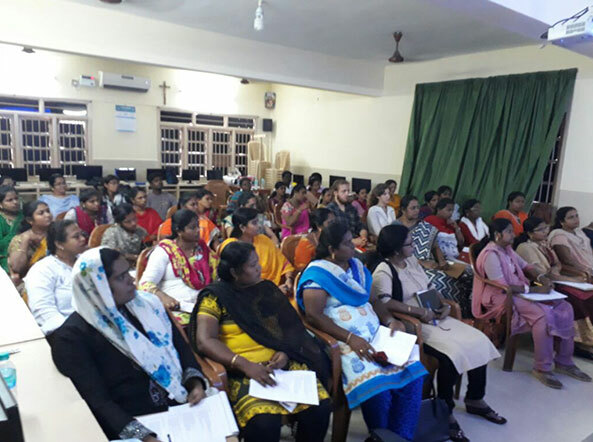 The venue was St. Bede's Anglo Indian Higher Secondary School, No: 37, Santhome High Road, Santhome, Chennai, Tamil Nadu 600004. The following people attended the inauguration ceremony. 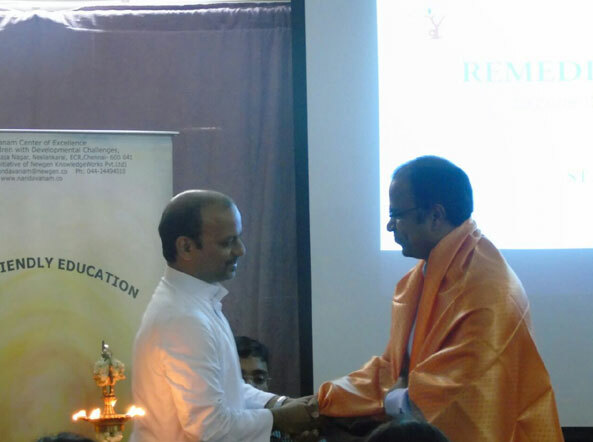 The ceremony began with the lighting of the lamp by Mr. Senthil Kumar, Fr. 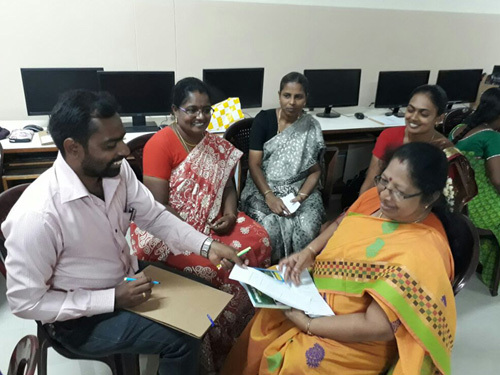 Paul Raj, Dr. Veera Punch, Dr. Suchitra Ramkumar and a participant. After the lighting of the lamp, Dr. Suchitra Ramkumar spoke about the conception, the thought process and the objective of the workshop. Next, Mr. Senthil Kumar gave an inspiring talk based on his experience with one teacher who contributed significantly to his growth in life. He wished the participants to be inspiring teachers and to contribute their best for the overall well-being of the children. The training programme commenced with introductions between the participants and the faculty. The participants were asked to put forth the difficulties they experienced in teaching, classroom management and with their students. The participants responded enthusiastically. Dr. Veera began her session with a thought-provoking question on ‘what is the role of a teacher?’ She further went on to talk about the need to impart knowledge with love and care. She explained the relationship between home, school and world, a model as proposed by Rudolf Steiner. Home prepares for school and school prepares for world. She proceeded to explain the child who is being educated as someone who not just carries the hereditary traits but also an individual with a spiritual dimension. She continued to discuss the importance of the period between 0 and 7 years in child development. This age group is fundamental in organ development and discussed motor milestones and speech milestones. She explained the long-standing impact on health when a child in this age group is stressed. She then talked extensively about the developmental stages of a child in terms of both physical and soul development. The smaller the child is the more he learns from and through love. It is important to know the developmental stage in a child so that we know what a child can learn and what a child cannot learn. Children’s unwillingness to listen can be due to over knowledge. Every stage requires the correct amount of intervention for the child’s spirit to unfold. Post lunch, the training began with a a session on movement by Dr. Suchitra Ramkumar. The participants enjoyed it immensely. Ms. Anandhi talked about the inner life of the child and the need to teach languages, math and subjects to strengthen the inner life. She further talked about the need for story in child education as a requisite for inner life of a child. She discussed various genres of stories. She worked with the participants using various activities, exercises and movements to teach children tables, letter recognition, letter formation, sound of the language and to help children understand the sense of rhythm. She ended the session by telling the participant a story. The day ended with a 10-minute session by Ms. Arthi summarizing the day’s session. This was used as a reflective time for both the participants and the trainers alike. Dr. Veera Panch started the session with a recap of her previous day’s session and explained in detail soul development through the stages. She explained the above-written verse. She made the participants do an activity involving pebbles and a plant to help them understand the relevance of awakening the feeling in children to help them understand and learn better about observation. She talked about the seven virtues of a teacher in detail. In the end, she gave the following verse for the participants to carry forward. Ms. Anandhi started the session with a recap and reinforced that stories are the soul food. The child can understand the complexity of life with stories. She talked about developing the inner morality of the child and about thinking being the inner movement. She taught various child-friendly activities to introduce aspects of language like sounds, grammar, spellings and math. Post lunch, the training began with movement by Dr. Suchitra Ramkumar. The previous day’s movements were practised to achieve mastery so that the teachers in the classroom could impart the same. The next progression for the movement exercise was also taught. 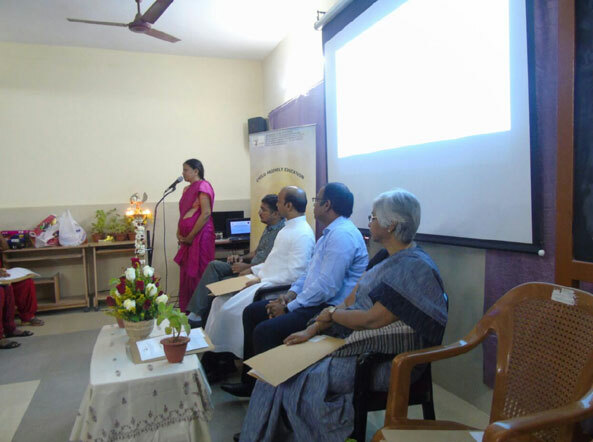 Dr. Suchitra Ramkumar conducted this interactive session. She asked the participants three questions based on which the whole session was conducted. 1. What does ‘education’ mean for me? 2. What would I as a teacher do, If I owned my own school? 3. What is my view on children? Answers to each of the above-mentioned questions were discussed in detail by the participants and Dr. Suchitra Ramkumar. The day ended with Ms. Arthi summarizing the day’s sessions, day’s reflection and a brief about the next module. What are the 5 things that you learned or that touched your heart during the two-day training module? What are the 3 things that you will carry forward in your teaching? The center has a congenial space, both indoors and outdoors, that is fully equipped to serve children with neuromuscular and developmental challenges. The six-day module is all about understanding and experiencing the processes involved in learning. We will be looking into how children learn and various skills required for academic success. Participate in economic development by being an ethical and ecologically sustainable business respecting the rights of employees. Improve the quality of life of the workforce and their families. Contribute to the welfare of the local community and society. © Newgen KnowledgeWorks. All Rights Reserved.